Forget love - I would rather fall in chocolate! Chocolatier, author and pastry chef Alice Medrich is today world famous. Do you know she actually began her career with a hand-written recipe for cocoa dusted truffles given to her by her landlady in Paris, Madame Lestelle? She says, it was pure intense bittersweet pleasure which left her momentarily speechless. 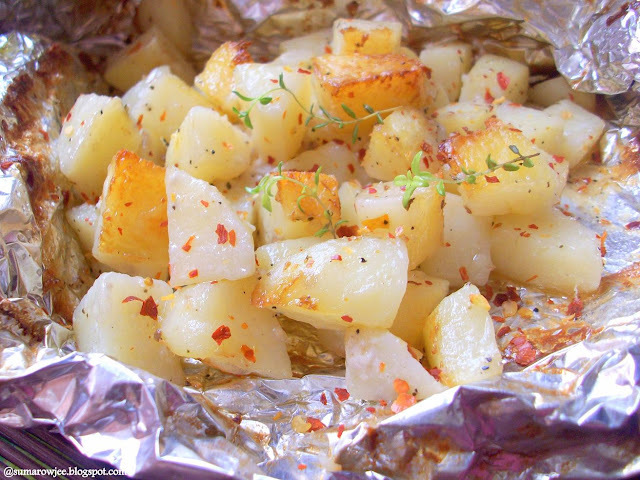 Back in Berkeley, CA, USA, she introduced truffles, even as she continued her post graduate studies. 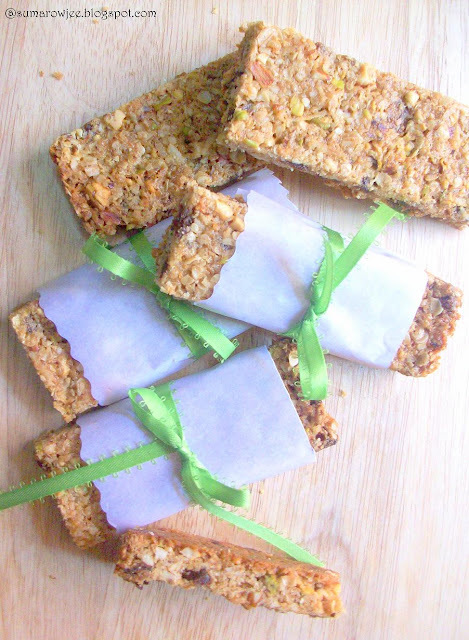 She made French cakes and truffles at home and sold them at Pig-by-the-Tail Charcuterie. When her business grew too big for her home kitchen, she went on to open her own chocolate dessert shop, Cocolat., which eventually became a chain of 10 stores! Alice is credited with introducing truffles to America, creating a sensation, delighting her customers with the tiny chocolate dessert. 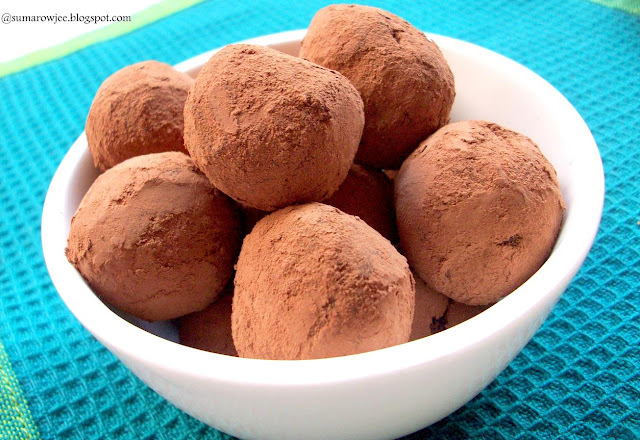 The original Cocolat recipe contains raw egg, but here is Alice's recipe for her favorite truffles. The egg here is heated adequately to prevent any risks associated with raw eggs. Just what I love - the richness eggs bring, but perfectly safe, not to mention delicious! I have tried the egg less ganache-like versions with chocolate and cream a few times, but I must admit, I found these truffles a fantastic and luxurious way of enjoying some bittersweet pleasure! Do you know truffles are made mis-shaped to simulate real truffle fungus? The cocoa powder the truffles are rolled in are to simulate the dirt in which real truffles grow in. ( Not the most appealing of comparisons I would say!). 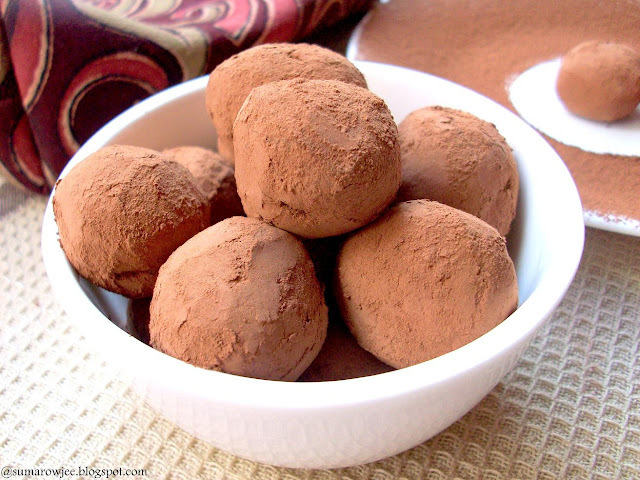 However, truffles are also rolled in nuts, coconut or tempered chocolate. The flavoring used could be vanilla, espresso, herbs, spices... limited only to your imagination. 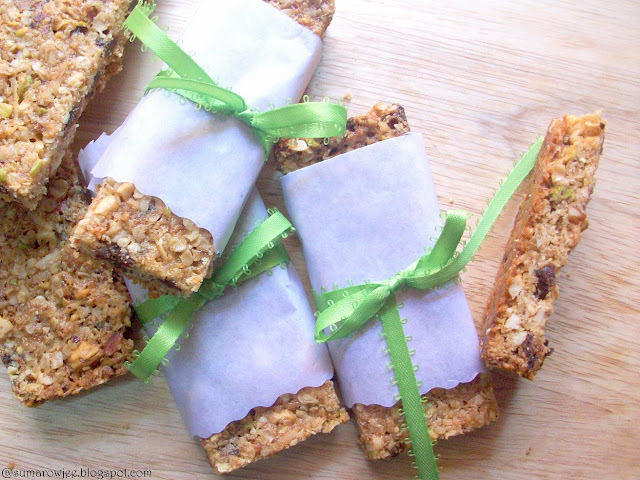 The recipe is fairly simple and quick, but an instant read thermometer is necessary equipment. A little bit of careful handling and your truffle mixture will be chilling in your fridge before you know! I have made half the recipe given below. A note about the chocolate : You could use any domestic bittersweet or semisweet chocolate that does not have a percentage on the label (Thankfully!) or any brand marked 50-62%. If using chocolate marked 64-66%, use 6 0z chocolate. If using chocolate marked 70% , use 5 1/3 oz, dissolve 2 teaspoons sugar in the hot water before adding it. Procedure: Mise en place. Place the chopped chocolate and butter in a microwave safe bowl (if using a microwave to melt the chocolate). Place the egg yolk in a small heat-proof cup ( I used a tallish steel tumbler). Make sure the water level comes halfway to the cup you would be placing in the skillet. At the same time, the cup should not be low enough for any hot water in the skillet to get in accidentally. 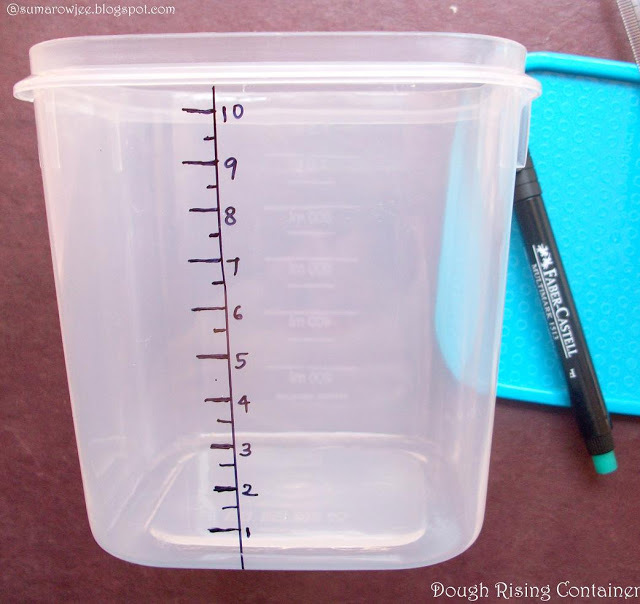 Measure 1/4 cup of water and keep it ready on the stove to boil when needed. Do not try to add directly (as you measure at the same time) to the yolk as stopping stirring in between caused the egg to curdle when I made this the first time. Ouch!). Have a fine strainer suspended over a clean bowl. ( You will be refrigerating the truffle mixture in this bowl). 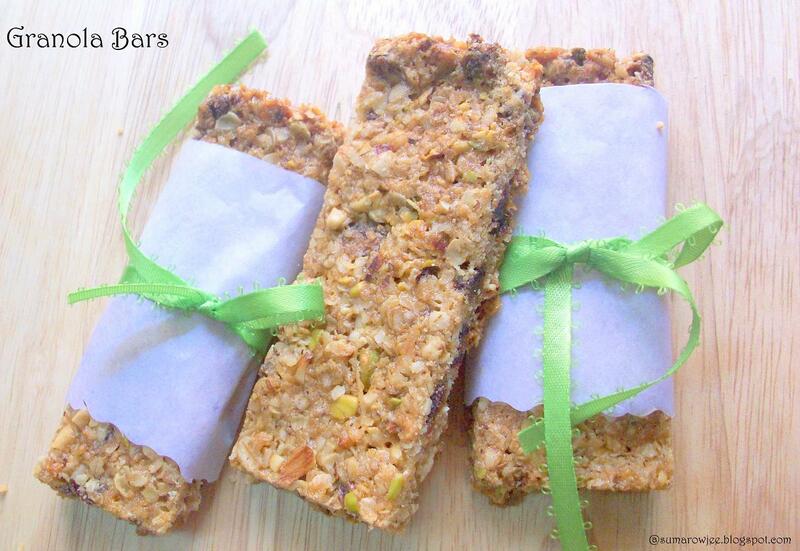 Have a pair of tongs ready to hold the cup in place as you whisk. A fork to stir the egg, a spatula. Of course, your instant read thermometer. 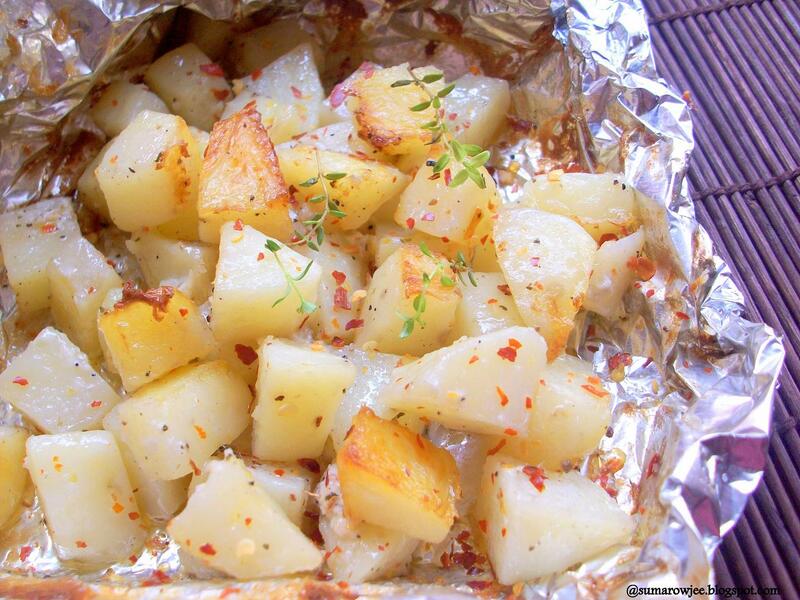 Place the skillet of water on the stove, bring it to a gentle simmer, leave it on the lowest heat. Melt the chocolate and butter till smooth in the microwave or in the skillet of simmering water. Set aside. Slowly and gradually, stirring constantly, add the measured boiling water to the egg yolk in the cup. Set the cup in the skillet, stir constantly with the fork till the mixture thickens slightly to the consistency of light cream. About a minute. Your instant read thermometer should register between 160 F and 165 F. Remove from the heat immediately and scrape the yolk over the chocolate. ( which will be almost room temperature by now). Add the vanilla extract. Stir gently, without whisking or beating, just until the egg is completely incorporated and the mixture is smooth. Pour through the strainer. 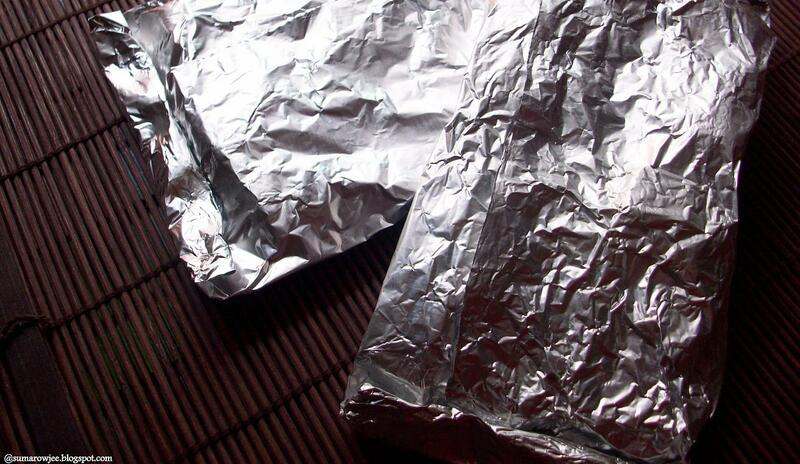 Cover with cling film and refrigerate until firm - 2 hours or more. To form the truffles, take a melon scooper or spoon, dip in hot water, wipe dry and scrape across the mixture or scoop out the mixture and form small 1'' balls. ( My mixture was not very hard, so scooping was fine, not sure if it had to chill more. 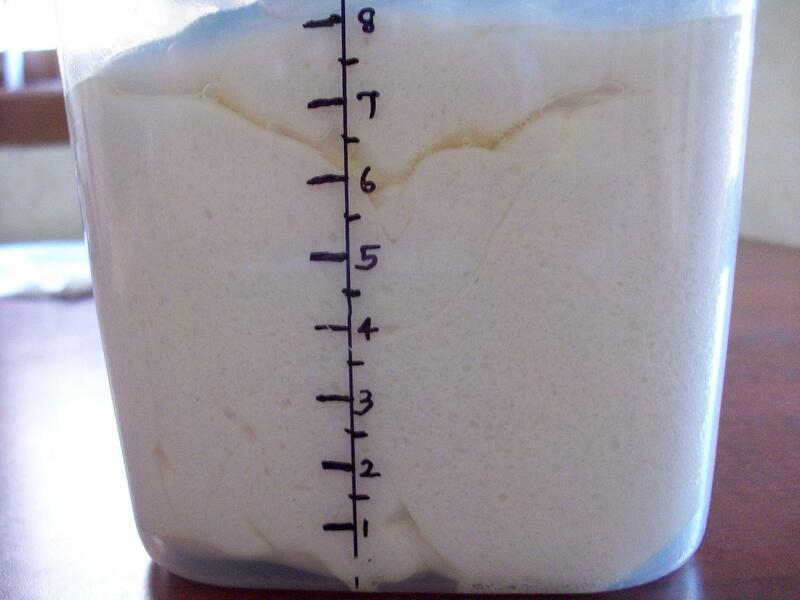 If the mixture is very hard, keep it out room temperature till it softens a little) They must not be perfectly round. Take the cocoa in a large shallow bowl, drop the shaped truffles in them and shake to coat the truffles. 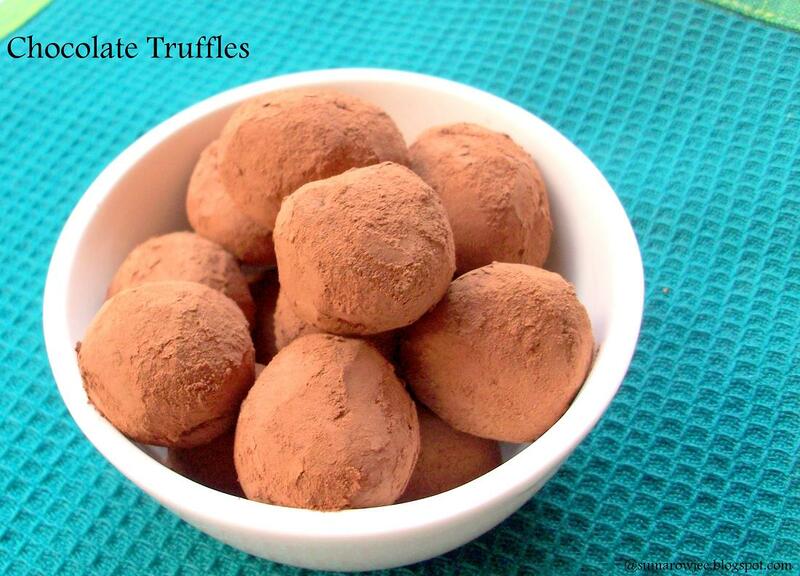 Store the truffles tightly refrigerated for up to 2 weeks or freeze up to 3 months. Again, am not sure if the truffles I made were as firm as they are meant to be, but they sure were yumm and had a very nice mouth feel, almost disappearing quickly on the tongue! I am going to be making more of these and try more variations. 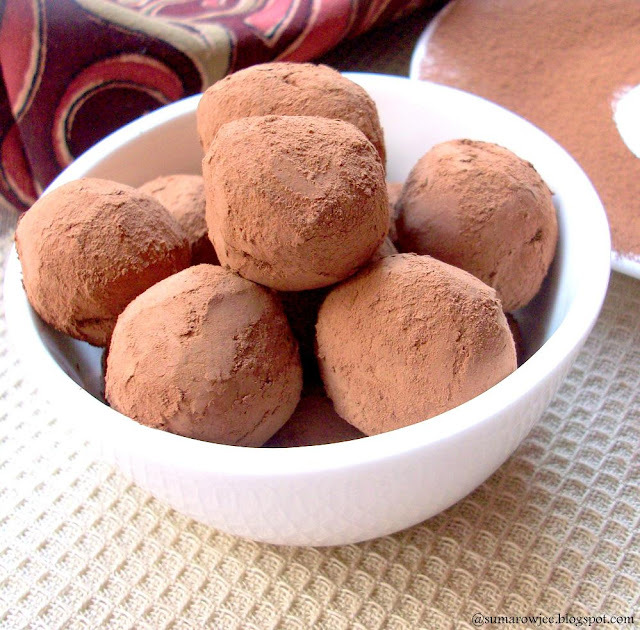 If chocolate is your pleasure, you must make these truffles! Mangoes are perhaps the most loved and awaited fruit, at least in this country. And much before they start appearing, we are ready with a list of desserts to be tried during the season. From the very common but beloved aamras and puris to exotic, layered, set desserts, from the luxurious mango mascarpone cakes to the diet friendly froyos we want to try them all. Oh, why did this so very delicious fruit have to be seasonal? 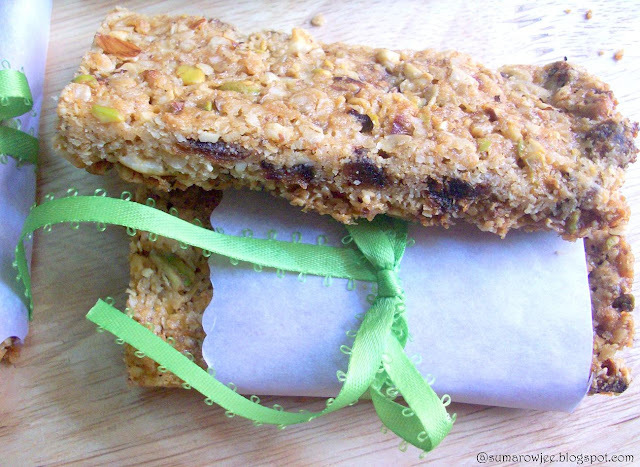 Perhaps, nature's way of helping us keep our (over)weight in check? :) The surprise but very welcome showers here are a great relief from the heat, but when did rains ever take the pleasure out of enjoying ice creams and cold desserts? Saffron is worth its weight in gold, pretty much a rich man's pantry ingredient, this luxury spice has been traditionally used in Indian cuisine since ages . Probably one of the few spices sold in packs of as less as a gram, saffron gives a wonderful aroma and rich color to food. I would have loved to use more of this and more often if not for the prohibitive price. Come to think of it, good quality saffron is not very commonly available either. So when Maitreyee Ghosh of VAV Sciences sent me an email asking if I would like to try their saffron extract (something really new to me), could I really refuse? As per the information provided on the VAV site, saffron extract is food grade extract of saffron where it is treated to enhance the natural flavor. You would need less of this liquid extract as compared to dry saffron strands to impart the same amount of flavor, hence making it relatively economical. Saffron extract can be stored for up to 24 months without loss of flavor. As this flavoring is in liquid form, its easier to measure as compared to saffron strands. As the saffron is in liquid form you could use it directly without having to soak in any liquid. 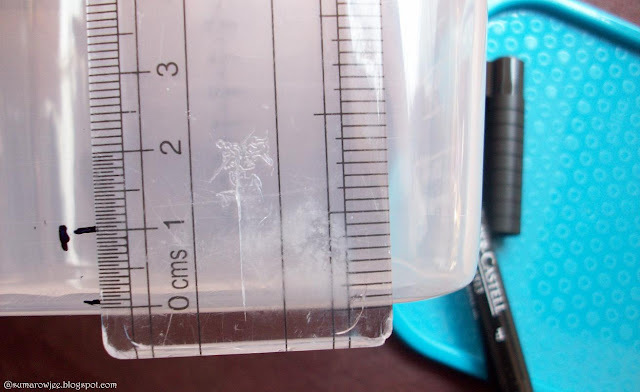 I have tried using it in a cake too and it gave a lovely flavor, I would have loved to post a cake here and would have done so if I were not unhappy with the texture. Kulfi is an all time favorite, being the easiest, fuss free and quickest in the ice-cream category. 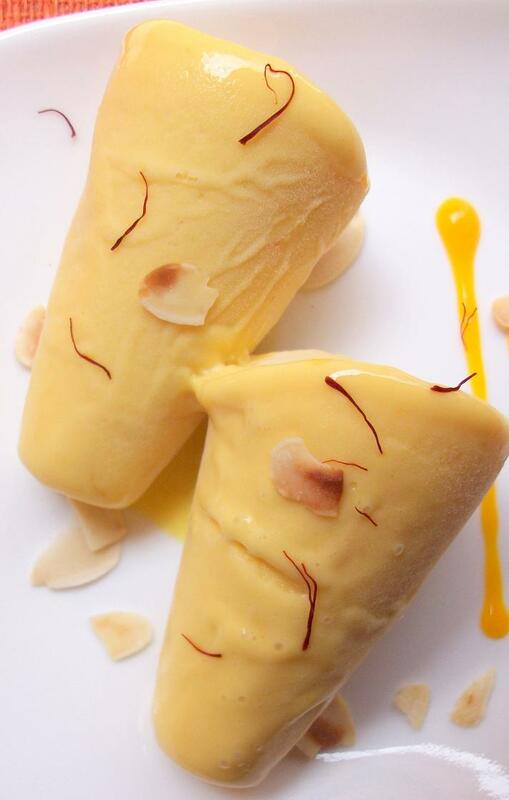 With the mangoes in season and with the saffron extract waiting to be used, it had to be Saffron Mango kulfi of course! With a half used tin of condensed milk and a bit of fresh cream to be quickly finished, this recipe seemed to be the one to try! 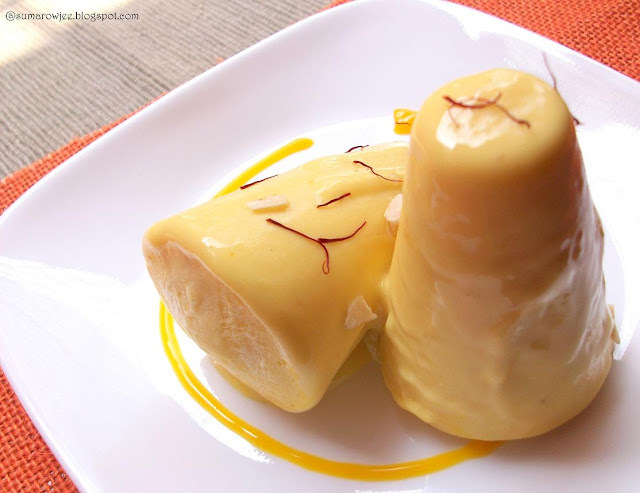 The kulfi turned out to be creamy and dense and delicious of course, making this a recipe to be tried again. Recipe adapted from Tarla Dalal . I have used fresh cream in place of milk powder and reduced the sugar. In the original recipe, all ingredients (except the mango pulp) are combined and simmered for 10 minutes, then the pulp is whisked in, cooled. I have simmered and reduced the mixture, then carried on with the recipe. Milk - 500 ml / 2 cups plus 4 teaspoons to be precise! 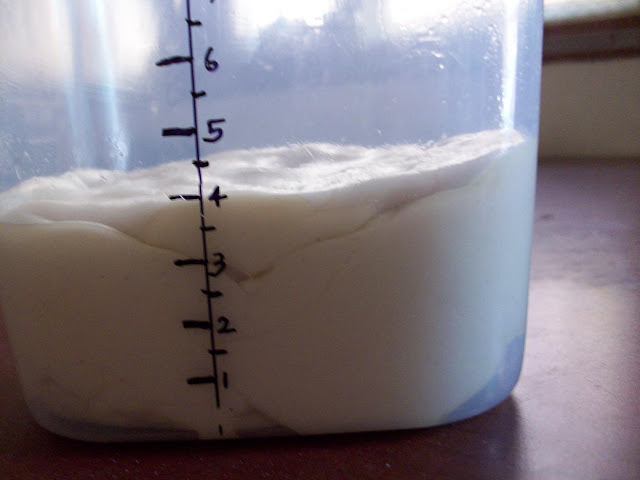 Procedure: Take the milk in a heavy bottomed pan and boil on low heat till it is reduced to 1 1/2 cups. (Approximately 15-20 minutes, depending on the heat given). Whisk in the condensed milk and cream. Simmer for another 5 minutes. Take off the heat. Cool completely. Whisk in the saffron extract and the mango pulp. Taste and add powdered sugar if needed, remember kulfi will taste slightly less sweeter when frozen. Whisk till it is homogenous. I whizzed it in the mixer for half a minute just to make sure the pulp is mixed well. Stir in the nuts if using. Pour into moulds and freeze till set and firm. Mine took about 5 hours. To serve, dip a kitchen towel in hot water and wipe the mould with it for a few seconds. Invert and tap it sharply on the plate. 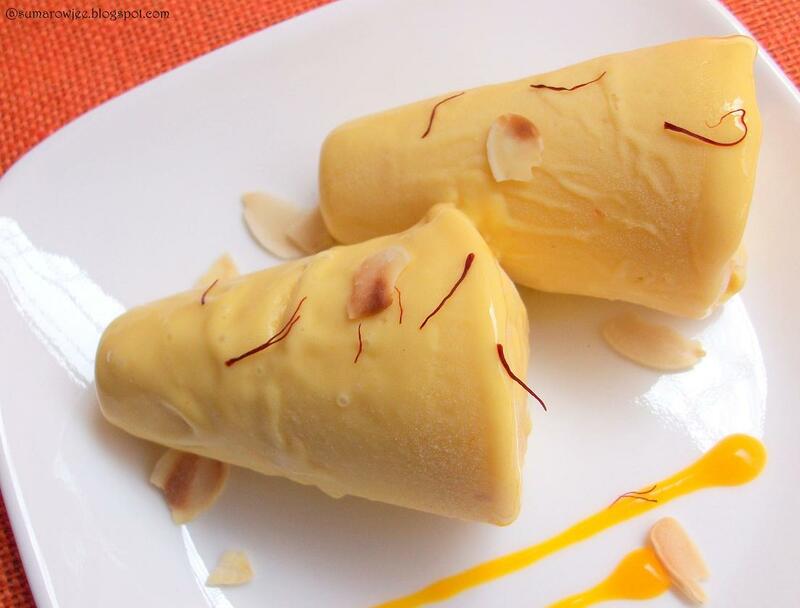 Let stand for about 5 minutes if you like your kulfi slightly creamy when you dig in! Please note: Hubby felt that the saffron flavor was a wee bit more, probably because of this, the mango flavor was relatively less. I will add less of saffron next time. 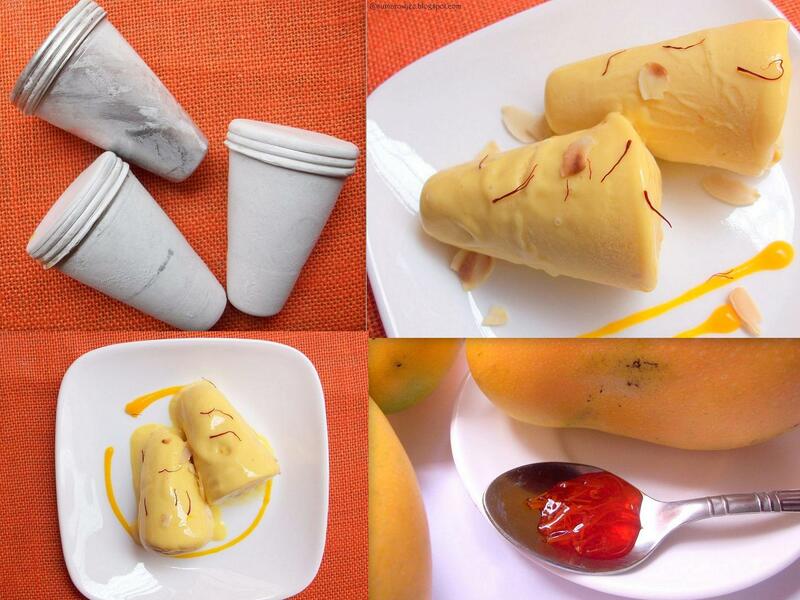 Make sure you use good quality ripe mangoes for maximum flavor. Use cardamom and / or saffron for flavoring or omit the saffron and cardamom altogether. You could also add 2-3 tablespoons of unsweetened khoya/mawa when you simmer the milk mixture if you wish.